If you’re looking for a helpful, efficient, and unique way to enhance your grilling experience, then it’s time to start grilling with granite. Grilling on cutouts of granite countertops offer several practical advantages for both culinary prodigies and at-home chefs. Using granite to heat foods was one of the initial cooking methods developed during prehistoric times. Although this technique is ancient, it remains practical today because granite slabs distribute heat evenly, making it an ideal cooking surface. When using a grill, one of the disadvantages is that there often isn’t a solid surface available. Grill grates are perfect for getting the classic geometric char lines on steak, chicken, hot dogs, and even large vegetables, however, many other foods are off limits because they will fall through the grate. This quickly becomes annoying when you’re forced to run back and forth between the kitchen and backyard to prepare everything on the menu. With a slab of a granite countertop for grilling, all you’ll have to do is place it directly on top of your grill grate to make foods like eggs, pizza, sauerkraut, and green beans, which would have otherwise been impossible to prepare on the grill. Not only does a piece of granite countertop allow you to prepare these items but because the heat is dispersed evenly through granite, it helps you achieve culinary perfection and true grillmaster status. Cleaning and maintenance is a breeze for a granite countertop, whether you’re using it to grill or simply as countertops in your kitchen. Before cooking, simply clean your piece with soap and water, as you would with any other cooking vessel. Once you’re finished, simply wipe the piece down and then it’s as good as new. 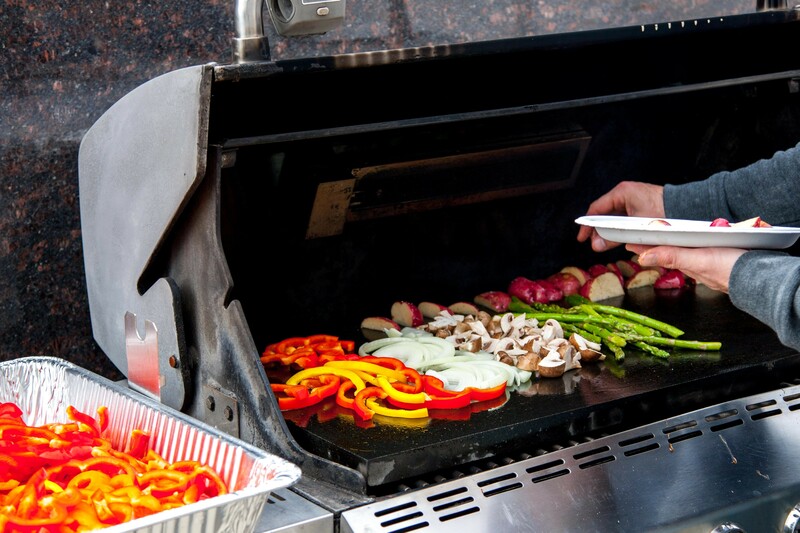 Before using granite on the grill, ask your local sales representative about what specific variety is ideal. With thousands of options always in stock, there’s no larger selection of granite kitchen countertops available than at Marble.com.